Getting an acoustic piano from one place to another is something better left to the professionals. This is why if you are purchasing a piano from a store or dealer and they offer a delivery option, you should take that option. But for you brave ones determined to DIY–or if you are buying a piano from somewhere other than a piano dealership–this blog will set the scene for what to expect. Paying for piano delivery can seem like a lot of money at the time (likely a couple hundred dollars from a piano dealer) but it will save your back and your friends backs; a lot of time, worry and hassle; and potentially save you money as well. Some dealerships may even give you a discount on delivery with your piano purchase. P.S the other way to avoid moving an acoustic piano is to get a digital piano instead. Easily carried by 1-2 people, fits in the car boot (with back seat down), doesn't require tuning and is generally less of a headache to get into your home. See these posts on buying digital pianos and what you need to know. An upright acoustic piano weighs from 130-180 kg (300-400lbs) for a smaller upright to 220-360 kgs (500-800 lbs) for the bigger uprights and grand pianos up to 540 kgs (1200 lbs)! That is anywhere between 2 to 8 times the weight of an average couch! This is some serious back-breaking work even for a team of people so you need a serious professional or a seriously prepared process to get through without damage to you or your piano. Many moving companies will offer a piano moving service, but this is usually charged separately to the rest of the move (if you are moving other items also) because of the additional work involved. The first port of call should be professional piano movers that specialise in this area, they know exactly how to treat the piano so that there is no damage and will have all the specific equipment and tools necessary. If there are none in your area, call your local moving companies or look them up online to find out whether they offer a piano moving service. Fancy a foolproof checklist to get things moving? 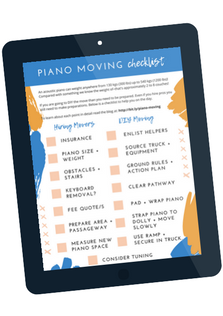 Add your details here and I'll send you my FREE Piano Moving Checklist (for both hiring movers and DIY moving) for you to print out and use to make moving your piano easy-breezy! From now on you'll also receive the Piano Picnic weekly newsletter with tips, advice & interesting piano articles to keep you inspired! If the newsletter is not for you, you can unsubscribe at any time. Come on over to our Facebook group 'Let's Talk Piano' and join the community there! There’s hundreds of piano-fans just like you all hanging out & talking keys! Discussing insurance cover is essential. Ask what type of cover they have as a company and whether it will cover the full cost of the piano if it is irreparably damaged. If you aren't satisfied then you will need to talk to your insurance company to confirm you have full cover which includes it's transportation. The specifics of the move should be discussed in detail. What obstacles are in your home that will need to be planned for, are there stairs up or down? Is there a thin hallway or doorway to manoeuvre through? Are there steps, thresholds or slopes to navigate? These things should be discussed beforehand in order to get an accurate quote for the job. Occasionally piano movers may opt to “keyboard” a piano before moving it to make things easier for them. This involves removing the keyboard of the piano in order to fit through tight spots, let them know at the outset if you prefer this isn't done. Price should be discussed beforehand and is dependent on the details of the move: the obstacles inherent, the distance to travel, and the weight and size of your piano. Some movers will have a flat base rate for piano moving and then charge an hourly rate, some simply a fixed or hourly rate. To give you an idea, some quotes start at USD$100 for a small upright piano over a short distance. If it involves stairs it would cost around USD$250. A valuable concert grand piano moved a long distance could cost up to USD$1000. So as you can see, it ranges depending on the piano and the situation so always discuss with your mover BEFORE making a commitment and get multiple quotes from different companies. The size and weight of your piano should be disclosed in your original discussions with the movers. If you do not know the weight of your piano you can simply tell them the model and make and they should be able to work it out from there. To measure your piano, measure an upright height from floor to the top lid. For grand pianos measure the length from one end of the keyboard to its bow. This information will allow the movers to calculate how many men will be required and what equipment they will need. Make sure the space where the piano is going is free of any other furniture or items that may get knocked or be a obstacle during the move. It's a good idea to clean the area and vacuum to avoid a dust cloud once the piano arrives and remove any unattached rugs that could be tripped on. It's best not to have direct sunlight on the piano as extreme temperatures can warp the body, be also aware of humidity levels as extremes can cause damage over time. DOING IT YOURSELF (For the die-hard DIYers). The cost of moving your piano yourself should also be considered. As well as enlisting your well-muscled friends and family to exert themselves on your behalf, there is specific moving equipment required for a safe and damage-free relocation. A dolly and hump strap are essential for a move, it is never advised to simply get enough strong people to lift the piano off the ground and carry it as you will injure your bodies and potentially damage the underside of the piano. Use of a dolly and hump strap allow the piano to be eased and pushed along the floor or ground rather than lifted completely. If you have access to these items than DIY moving may not be expensive for you, but if you need to purchase these items (including hiring a van or truck) than you’ll see how the costs can add up. It's important that you go over the process with your moving helpers before you begin. Lay some ground rules such as: who is the lead director; that you should move always endways not with the widest side; everyone needs to wear work gloves to avoid slippage; and to always lift with the legs and have a straight back. Be extra careful when going over any edging or thresholds, take care that pressure isn't put on the legs of the piano as they are not strong or made for rolling the castors along (they're just for repositioning not for travelling). Take your time and move only a few inches at a time. Think about the angles required to fit through doorways before you get to them. Clear the path, remove obstructions and any unattached carpet or rugs. Lock the piano lid down and place padding over the lid. Wrap the piano with cloth or plastic wrap and secure with tape. Lift piano on the dolly. You may be able to lift one end and have an extra person slide the dolly underneath, then lift the other end and fix the dolly in the middle. Strap the piano to the dolly with dolly straps. Push the dolly slowly with the tips described above. Use a ramp for getting in and out of the van or truck. It should be pushed and pulled up or down the ramp so it doesn't get too excited and go off the other end. Secure the piano in the van, place it against the back wall with plenty of other things around it including furniture, or strap in place. The keyboard side (padded) should be against the back wall. If there is only one step it should be possible to angle the piano on the dolly up or down as it is pushed along. Or use weightlifting straps to lift the piano and dolly over. If there are more stairs you’ll need to remove the dolly, place cardboard pads on all steps to avoid markings, and use weightlifting straps to lift one step at a time. This is very tiring to the lifters and is the main reason why you might choose to leave it to the professionals. There is a common misconception that pianos go out of tune immediately when they are moved from one place to another. This isn't strictly true, pianos are solid instruments and when handled carefully are unlikely to go out of tune just because they are transported. The thing that usually makes them go out of tune is a change in temperature or humidity. So if changing from a very warm, small apartment to a large cool house it is likely that after a week or so, as the pianos soundboard adjusts shape with the new environment, it will start to sound out of tune. The same effect can happen moving from a cold room to a warm room, even in the same house! Whether or not you think the temperature or humidity change is significant enough to warp the soundboard the best idea is to wait a few weeks to let it settle to the new environment and then decide whether the piano sounds out of tune or not. An upright piano however can sound out of tune if it is placed on an uneven floor. Because it has four legs, if even one is out of balance with the rest it causes the body of the piano to flex and sound temporarily out of tune. 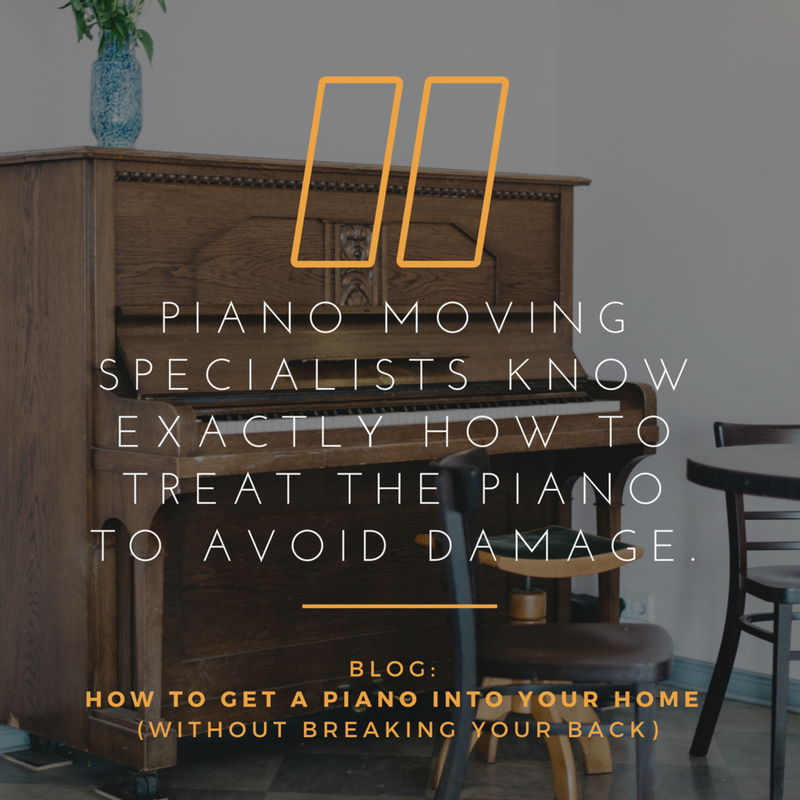 This can be fixed by simply shifting the piano to an even surface, looking out for things like one castor off the carpet, or in a low spot of the floor. If your unsure about whether your piano needs a tune or not, think about when it's last tuning was. Was it more than 6 months ago? On average, pianos should be tuned once or twice a year so if its been a long time your piano might have needed a tune anyway, regardless of the move. Still unsure? Call your local piano technician and talk to them about it. They’ll be happy to offer advice and recommend the best course of action.